tags: Golden Stag Beetle, Lamprima sp. Those familiar with the Greek classics will know the tale of the 12 Labours of Heracles (Hercules in Roman mythology). As penance for killing his own family Heracles was told by the Oracle at Delphi to serve King Eurystheus. The King assigned him twelve tasks, all of which put Heracles’ life in great danger. The third task was to capture the Golden Stag of Artemis which after a year of traipsing around the Mediterranean (sort of like the first Contiki tour) he accomplished. This week I accomplished the same task in a fraction of the time. Rustling in the undergrowth in the garden was a Golden Stag Beetle ( Lamprima aurata) – or maybe it’s a Golden Green Stag Beetle (Lamprima latreilli). 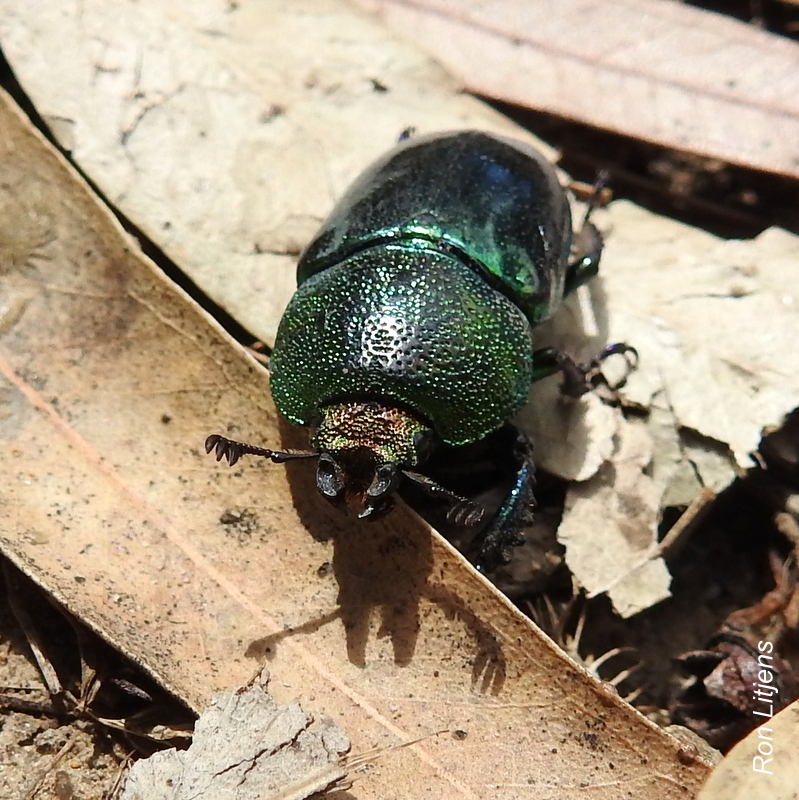 Either way it’s an impressive looking insect – iridescent green wing casings, blue legs and an orange-pink head. The male and female beetles of this genus are vastly different in size. 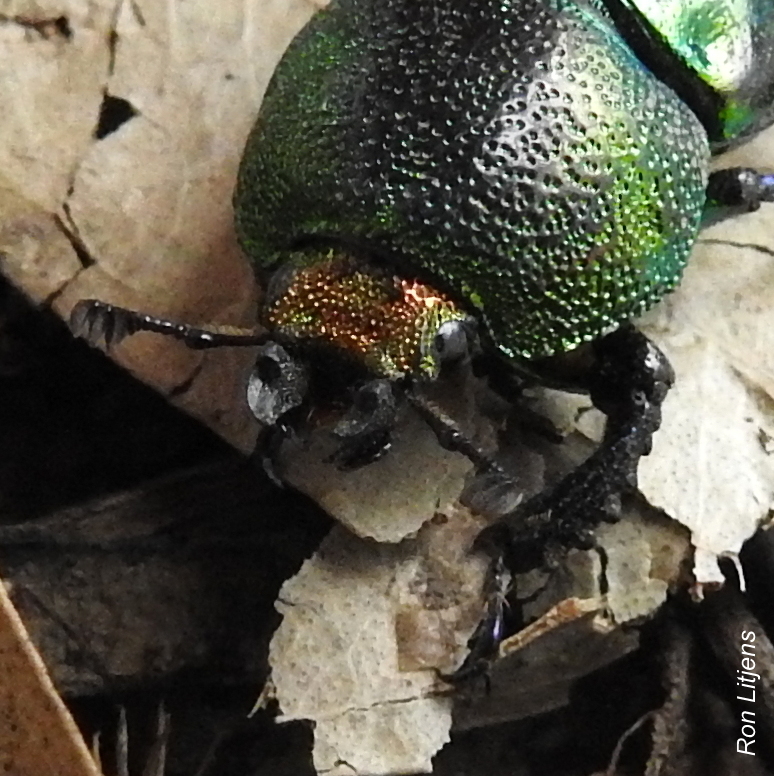 The one pictured is a female so the large mandibles which give the beetle the ‘stag’ description are very small (right). The adults feed on dead wood and the larvae inhabit rotting trees. When I was a kid I seem to remember collecting handfuls of these around Xmas time. Up until this week I hadn’t seen one in years. Maybe capturing the image of a Golden Stag Beetle doesn’t rate with capturing the Golden Stag. Given it’s lunchtime, maybe I don’t really feel like a Greek god – I’ll settle for a Greek yoghurt instead. beautiful in an unusual way. not a greek salad which would be reminiscent of the beetle’s colours? beautiful photo and great story!